08 ? NIMBYism is not enough! 09 ? ERTMS: the biggest public-sector computer project ever? 10 ? Can we afford ERTMS? 11 ? Delays? So what! 12 ? WCML modernisation: a grim portent for ERTMS? 13 ? The Uff/Cullen Report - why are Network Rail ignoring it? 15 ? GSM-R masts: why so big, and why so many? Network Rail plan to erect over 2,000 microwave radio masts, one every four or five miles along every railway line in the UK. Each of these masts will be at least 33 metres tall - as high as a 12-storey block of flats. Because of a legal loophole, they don't need planning permission, even in Areas of Outstanding Natural Beauty and Conservation Areas. Network Rail say the masts are needed for safety reasons. To support this claim, they cite the Cullen Report on the Ladbroke Grove crash and the Joint Uff/Cullen Report on Automatic Train Protection (ATP). But both Reports contain compelling evidence against the masts. The Cullen Report warned that fitting ATP on top of TPWS (Train Protection and Warning System, which is already installed throughout the UK) would bring negligible safety benefits at enormous cost. Yet Network Rail now propose to install ERTMS, a form of ATP that requires microwave masts, at a budgeted cost of £4,280 million. A report published by the Health and Safety Executive estimates that ERTMS will prevent no more than 16 fatalities in 40 years, at a cost of £267.5 million each. According to the Cullen Report, the same money spent on road improvements could prevent 42,800 fatalities, at a cost of just £100,000 each. And Network Rail has chosen an unproven, non-standard version of ERTMS, flouting the Joint Uff/Cullen Report, which recommended a standardised version (Level 1) that does not require masts. In pioneering this grandiose scheme, Network Rail are betting huge amounts of public money on unproven technology, in return for virtually no safety benefit and minimal, and entirely speculative, performance gains (Railway Safety's best guess is a 10% capacity increase, but a report published by the Health and Safety Executive has cast doubt on this estimate, pointing out that TPWS has reduced capacity. Network Rail also say that the masts are necessary because of an EU Directive on interoperability, which is intended to allow trains to travel freely from one country to another. The original Directive has been extended to require all railways in the EU to implement a computer-based control system called the European Rail Traffic Management System (ERTMS). ERTMS will allow trains to be controlled from regional computer centres, with no need for signallers or drivers for normal operations. Network Rail say that the new masts, which use a technology called GSM-R (Global System for Mobile communications - Railway), will provide the radio communications required by ERTMS; they will also replace the existing driver-to-signaller radio systems. No other EU country has implemented ERTMS Level 2. Italy plans to use it on new High Speed Lines only, and neither France nor Germany have firm dates for implementing it at all. The only UK line that will be exempt from ERTMS and GSM-R is the Channel Tunnel Rail Link, which has to be compatible with the Channel Tunnel itself, which uses non-GSM-R technology. So the only section of rail for which the UK has sought exemption from the EU interoperability Directive is the only section of UK rail that interoperates with European railways. If the Government can't or won't divert Network Rail from this folly, they should at least prevent them from defacing the countryside with these enormous masts. Much smaller ones are available, down to 5 metres. 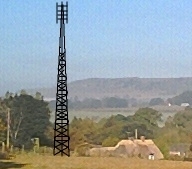 More of them would be required, thus increasing the cost, but the additional expenditure would be trivial in relation to the cost of the whole project - 'only' £171 million (less than 5% of the total budget) will be spent on the GSM-R network (including masts). And there are already proven alternatives that require no masts at all.